Drought conditions created by unseasonably warm temperatures and below average precipitation has stunted crop growth to about 50 percent of normal. Livestock feed on pasture is reduced by about 50 percent, while dry land hay production has suffered losses of about 85 percent, said an agricultural agent at Yellowstone County. “I’ve never seen anything take hold quite this quickly. We are in mid-September conditions right now,” said Dave Kelsey who’s been farming and ranching in Yellowstone and Stillwater counties for 35 years. “Dryland hay production is estimated to be 15 percent of normal, and most of the dryland spring wheat is ‘not expected to make a harvestable grain crop,’ Stillwater’s resolution read. ‘Livestock pasture and range conditions are extremely poor due to lack of precipitation, excessive winds and grasshoppers.’” Said a report. Agriculture is Montana’s no. 1 industry. Kansas. 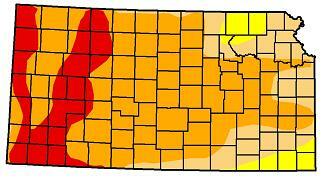 Governor Brownback has updated the Drought Declaration for Kansas counties, amid worsening drought conditions throughout the Wheat State. 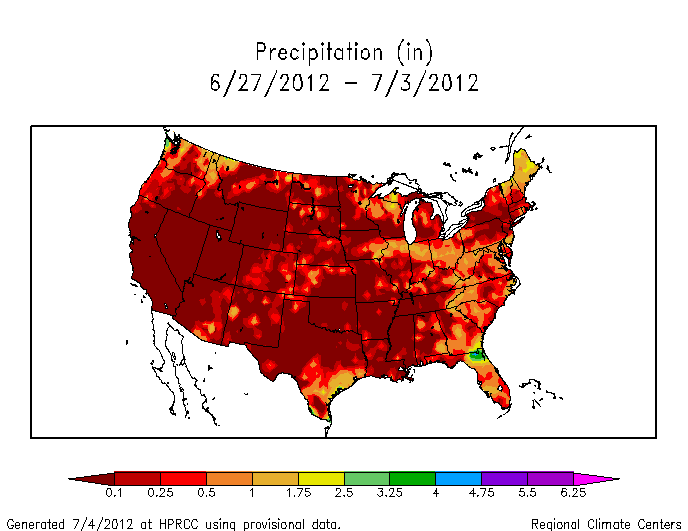 Norton, Kansas, was the hottest location in the U.S. with 118 degrees (47.8ºC) last week, NCDC reported. Some 22 other locations across the state topped 110 degrees on Thursday June 28. Drought has returned to Kansas with 100.00% of the state reporting abnormally dry or drought conditions (D0 – D3) as of June 26, 2012. Florida. Six more counties have been added to the Presidential Major Disaster Declaration for Florida, state officials said. They are Clay, Franklin, Hernando, Highlands Pinellas and Suwanee counties. On Tuesday, the Disaster President declared major disaster areas in Baker, Bradford, Columbia, Pasco and Wakulla counties due to the damage and losses caused by tropical storm DEBBY. DEBBY landed on June 27 in Steinhatchee, Fla, dumping more than a foot of rain in some areas and causing major flooding across the state. Eastern U.S. A massive heat wave continues to affect the eastern two thirds of the U.S., breaking high temperature records from the Midwest to the East Coast, said NWS. 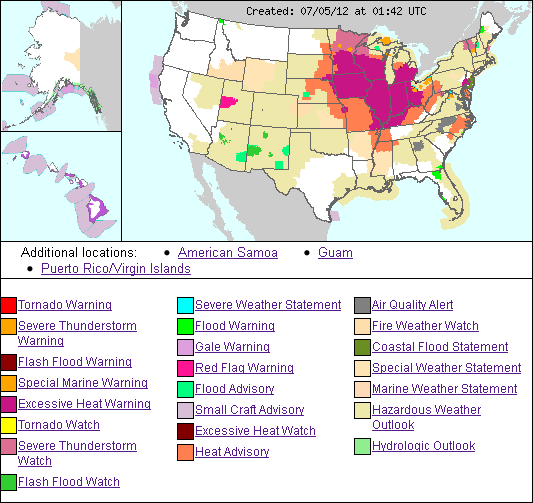 Heat Advisories were in effect throughout or in parts of at least 26 states, as of posting. See Global Alert in the next post.